If you’re looking for you or your partners wedding rings made from naturally white metals, other than silver, the decision comes down to either platinum or palladium. Yet, finding the key differences between platinum wedding rings and palladium wedding rings from a source you can trust is not easy. Here, I’m going to provide you the basic information, 7 key points, that allows you to compare the benefits and drawbacks between these two naturally white metals. After this you’ve read this article, you’ll be able to make an educated choice between a platinum and palladium wedding band. First, we’ll start with a bit of history to provide some context to later points about the physical properties of platinum and palladium wedding rings. Both platinum and palladium are considered among the rarest of metals on the earth's crust. Historically, palladium was discovered recently in the early 1800's, while platinum has been used by Pre-Columbian indigenous people in Central America, who made artifacts out of a platinum and gold compound. In Europe, platinum was first written about in the 1500's. Palladium was first used in jewelry in 1939 to alloy platinum. Palladium is actually more rare than platinum and is found only in a few mines around the world. Though palladium has been used in jewelry production for decades, palladium wedding bands have become particularly popular over the past fifteen years. In fact, since January, 2010, palladium has been officially recognized as a precious metal. Any palladium wedding ring more than a gram in weight is legally required to be hallmarked. Both metals are part of what is considered the "platinum group", a collection of naturally white metals that also include osmium, rhodium, iridium, and radium. 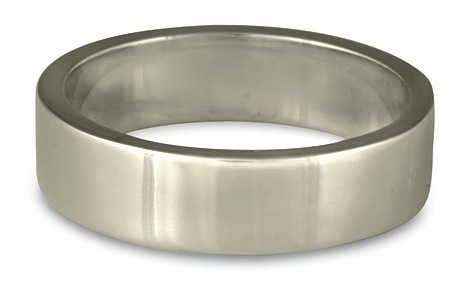 This comfort fit wedding band is made from recycled platinum. Of all the naturally white metals, platinum is the heaviest (densest) of all the metals while palladium is the least dense and lightest of them. Consequently, palladium wedding rings will feel considerably lighter than platinum wedding rings if held in your hand. Once you get the ring on the finger, however, it’s not likely you’ll notice the differences between the two metals. Overtime, the ring will just come to feel a natural part of your body. It is not that palladium is particularly light. For example, the weight of palladium wedding rings is comparable to 14K gold wedding rings, while platinum is about 75% heavier than 14K gold. This graph displays the various degrees of yellow in wedding rings and other jewelry alike. Both platinum wedding bands and palladium wedding bands are comparable in whiteness. Most people viewing a platinum wedding ring next to a palladium wedding ring would have difficulty telling the difference. These days, whiteness is determined by a color spectrophotometer developed by Gregtag Munsel, shown above. Unlike white gold, which can vary according to the alloys used in the ring, palladium and platinum are pure natural white metals. This graph shows the various hardness degrees of metals commonly used in wedding rings. In terms of hardness, as shown above in the graph, both platinum and palladium are hard metals, even harder than 14K gold wedding rings. On the MOH scale, platinum is rated at a 4 and palladium, a 5. However, when alloyed, platinum goes up to a 4.5 and palladium to a 5.75. Just to give you some context as to what these numbers mean, the bottom of the scale is talc and at the top is diamond. Your finger nail would rate at 2.5, the same hardness as pure gold or pure silver. The difference in hardness between and platinum and palladium wedding band is not significant in context to wearing over your lifetime. Both are tried and true choices. This unique palladium wedding ring was handmade in our Santa Fe studio. However, these numbers in regard to hardness are only general estimates because alloy plays a role in hardness. How a particular precious metal is alloyed can be highly technical and proprietary. Both platinum wedding rings and palladium wedding rings generally have 5% alloy. In the case of palladium, ruthenium is often used for 4.8% of the alloy, with trace amounts of copper or other components added in order to ease casting and fabrication. Platinum wedding rings are alloyed with ridium, rhodium and ruthenium. 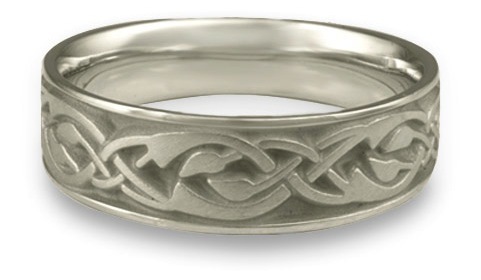 Additionally, noble white qualities and relative affordability of palladium has made it one of the most popular alloys for white gold wedding rings, particularly for those who prefer a nickel-free white gold. Both platinum wedding bands and palladium wedding bands will scratch, though palladium is about 10% more scratch resistant. Jewelers cleverly called the minute surface scratches a patina, Latin for "shallow dish". When scratched, palladium and platinum tend to "furrow" rather than chip. The metal can simply be put back in place on a nonabrasive polishing wheel. The ring will look as shiny as when it came out of its box. Both platinum and palladium are considered "noble metals" because they are naturally superior in their ability to withstand oxidation and corrosion. Also, neither will tarnish, both are hypoallergenic and both will remain white forever. This platinum wedding ring is adorned with diamonds. Both metals are fabricated using molds that can be created by hard carving wax or through computer-generated models on jewelry CAD programs. Unlike gold and silver, which can be molded and shaped by hand, both platinum and palladium are relatively brittle. They are more difficult to work with by hand and, outside of stone setting, they are typically cast out or dye struck. Anything that can be made into platinum can also be made into palladium, or gold for that matter. The most ethical wedding and engagement ring are made from Fairtrade precious metals. Several years ago, Fairtrade eco-platinum was coming out of the Ore Verde mine in Columbia but that mine has closed down. Only very small amounts of platinum are being processed as byproducts from Fairtrade gold mining and this material is not available. The best option for anyone who cares about mining issues is to purchase a palladium or platinum wedding ring made of recycled metal. Using recycled metals does not mitigate the terrible damage from mining, but it is still better than buying newly mined metals on the open market. Platinum wedding rings have a stunning crisp snow white color that create for a stunning ring. Platinum wedding rings have been, for many years, the preferred and more popular choice for those wanting white-metal wedding ring. Platinum are the most expensive metal used in jewelry and therefore, has more status and brand cache. Over the last few decades, however, more and more couples are choosing palladium. For many, the choice will come down to price. Palladium wedding bands run at about half the cost of platinum bands. They are simply more affordable. Once on the finger, there is really little difference between how the two metals appear. Good info to know. Is there anything on the horizon for getting Fair Trade platinum or palladium in the future? Any grass-roots movement we can follow or encourage? Platinum is sometimes in the actual gold ore, but the amounts are small and used by the importer. From what I'm seeing, I don't think fairtrade platinum is on the horizon. Palladium is even less likely. Interesting article. I didn't even know about palladium as a ring option. Palladium is actually a really good option... glad that you found the article informative. Nonsense re cost. Palladium is 2x cost but you only need half the weight as it is half as light. So rings approx same price. Hey Tim, Figuring this stuff out can be really confusing. At the moment, palladium is about $50 more per troy ounce than platinum in the international market. However, platinum is far more weight, as I explain in the article. Since the amount (weight) is the determining factor in actual cost, even though palladium is more costly per troy ounce, it is less costly in material costs for rings because it is so much lighter than platinum. Palladium ends up costing as much as 14K gold because of its weight, even though per ounce it is far more expensive than 14K gold. Tim, please see my response to Jennifer's comment above which addresses your concern. Platinum and palladium can't be moulded and shaped by hand? Then what the heck have I been doing all these years? What a load of hogwash!! Do some research people. Trent, thanks for your comment. You're right to point out the error in the article and I appreciate it. I meant to say that relative to gold and silver, palladium is difficult to work with by hand. I have modified the article accordingly. Thank you for such an informative and detailed article! I think that there is a typo in section 2 - "Of all the naturally white metals, platinum is the heaviest (densest) of all the metals while platinum is the least dense and lightest of them. " Thanks for your kind words about the article and also for catching the typo! I'll correct it. It should be palladium. Glad that you found the information useful! Good info. I just check some info,of this a few days ago .So surprise to find yours more clear.I will buy a beatifull ring that I seen on line. Thanks for your comment and also your kind words about the rings we make!